A 24 Hour motorsport endurance event is arduous for any driver. It can also be a fairly tough on the fan! For this reason, we offer an array of hospitality facilities on the Le Mans circuit offering you the chance to maximise your enjoyment of the Le Mans 24 Hours in a comfortable and enjoyable way. If you appreciate good service, a relaxing haven, great food and a well stocked bar or simply to be able to quietly chill out in the shade, then our hospitality facilities may be your finest purchase for the event. This superb air conditioned facility is located in the heart of the Le Mans Village. The facility offer two options; part of the restaurant offers an area where you can dine (3 courses + coffee & petit fours) and watch the racing; some of the tables are actually situated adjacent to the large windows overlooking the Le Mans track. Another part of the restaurant provides a simpler dining experience (3 or 2 courses) with much lesser view of the circuit. The prices for lunch or dinner include access to the viewing terrace but do not include any drinks. The facility has a stunning open air terrace where you can look down on the circuit and view the exit of the pit lane and the cars thundering past below you. There is also a cash bar in this area; champagne, sun and racing create a wonderful mix. The facilities can be pre-booked from the Wednesday through Sunday for both lunch and dinner. We are also able to pre-book space for larger groups to create formal, corporate entertainment. Please note that the open air terrace may become unavailable at short notice due to ACO activity. Please also note that for the track view option, not all tables will be adjacent to the windows; some tables may be a row back due to the limited linear length of the restaurant. This quality facility is superbly appointed and is located at Maison Blanche; the terrace overlooks the Ford curve. The marquee has a full bar area, a lounge area, televised monitors and an outside area with decking, garden furniture and parasols. This ACO approved hospitality facility is adjacent to banking which has steps from the garden area to the top for viewing. The marquee is decorated with flowers and is equipped with television monitors for full race coverage and also any other sport that might be covered that weekend. The facility will be open from 10:00 on Saturday to 16:00 on Sunday. Our Mulsanne excursion on Saturday night. Our shuttles will pick you up at the circuit and whisk you away to the Mulsanne straight. A three course dinner will be served; we have two sittings at 19:00 and 22:00. After dinner, simply wander out a few yards to the barrier of the Mulsanne straight. If time permits, we will also visit the Mulsanne Corner (which has a big screen) The Mulsanne Corner will require a general entrance ticket. Both areas are popular and can be busy; however, the Mulsanne straight has a viewing area of approximately 200 linear metres. Only available to group bookings 6+ with a full travel package. Package only available with a full travel & hotel booking. Dinner timings may be subject to change. Since 1962, the family Souffront have been serving superb gourmet cuisine from their restaurant which offers a beautiful parkland view. 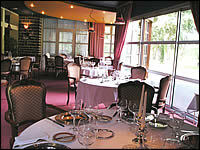 The Auberge is one of the oldest restaurants around Le Mans. The Michelin Guide to restaurants is also considered to be a reliable guide.